After a full year of anticipation, we are here at last, and the children are dropped right into the middle of urban Thailand: the motorcycles, the tuk-tuks honking at us, signs in their incomprehensible script, or in English advertising things never imagined (herbal massage, elephant camps, treks to see exotic hill tribe peoples), the shop-fronts with their sliding metal doors clanging open and shut, the pictures of the king everywhere, monks and novice students in their orange robes, the smells of diesel exhaust, fried food, jasmine blossoms, slow-moving canals, and rotting foliage, trying to use chopsticks, the arduous new hygiene protocol we keep throwing at them (“keep your hands away from your face!” “Wipe that soup spoon first!” “Do not rub your eyes!”), the spirit houses hung with garlands of marigolds next to ugly, decrepit shop-houses, having to walk around hot exhaust pipes of motorcycles and holes in the sidewalks opening directly on the sewers. It’s hot, even by Thai standards. Walking home from dinner last night, motorcycles roaring by, I turn to see Camilla, who is walking very solemnly, head down, with her hands over her ears. The first lesson learned this time around is that living abroad is much harder with children. There is no hopping both of us on a motorcycle to go places on a whim, and the various physical and hygiene risks loom so much larger. Those mangy soi dogs look a lot more rabid than they used to (soi is Thai for lane; Thailand is full of stray dogs asleep in oddly public places). Their jet-lag is our jet-lag, their dehydration is our dehydration, and their culture shock is our culture shock. There are significantly fewer places to live on the same side of the river as their school, and we are unwilling to have them breathe 20-30 minutes of gritty exhaust twice daily to live on the other side of town. If not in the hotel swimming pool, or a tuk-tuk, or being immediately engaged or entertained, they can be irrational, exhausted, and completely freaked out. Their little brains are full. This, of course, is not a condition restricted to children. Right now, we are all bunking up (in two bunk beds) in a single room, with the baths down the hall. We drive each other nuts regularly, but it’s reassuring for the kids to have us both immediately nearby. It’s very Thai–spotlessly clean poured concrete floors that are a real pleasure to bare feet, tepid water out of the taps (hot if you want it), crisp white bedrolls, teak furniture, icy air-conditioning in the room and the hot wet air in the open hallways. When you leave the room, the smell of Thailand hits you: a bit smoky with incense, vegetation, wet earth, a little vinegar and sugar mixed with two-stroke diesel fuel. The hotel compound is fantastic. Someone had this brilliant idea to mix something vaguely resembling eco-tourism, backpacker chic, and family friendliness, and set this budget resort on the grounds of an old school. The original old teak buildings are mixed with the new structures (all covered with orchids and other air-plants), a traditional teak pavilion for meals, a huge 20 M pool with a shallow kid-area, gardens with fruit trees labeled properly, shaded areas to play, ping-pong, etc. Part of a lamyai tree came down last night in the rain, and one of the groundsmen went at it with a machete before the chainsaws were brought in, distributing clumps of ripe lamyai far and wide. Despite the difficulties having the children along pose, it’s a great privilege and glory to watch them begin to learn and recognize. We are a long way from anything as daring as “exploration”: in these first few days, we seek to help them understand some basic etiquette and to learn how to eat, sleep, and use the toilet here. Camilla is very fond of the pressure hose you use to clean yourself after defecating, and both enjoy the squat toilets. Camilla wai-ed her first elder semi-properly today (the traditional greeting: hands clasped under the chin, bending the head down), and was thrilled to see the recipient’s delight. Ascher mastered sitting in a temple with the soles of his feet averted from the Buddha as if he was born to it. The differences in their age become very apparent in this setting. Ascher, able to process a bit more, said on his first day that he wished he had “ten thousand eyes to see it all,” and has already found things he loves: tuk-tuk rides, glimpses of the monkey chained to a stool at a bar at a certain curve in the moat road, a dish called “exploded catfish” and noodle soups. Before he had exploded catfish (shredded fish deep-fried into a thousand delicious fragments and drizzled with a powerful sauce) and moo daad-dio (sundried pork strips), he would have happily eaten the thousand varieties of noodle soup day in and day out. He’s also cultivated a taste for pad see-iu, a dry noodle, pork, and greens stir-fry, and salty lemonade, and has learned to sniff-kiss properly. He thinks the transvestites are very beautiful, although he wouldn’t want his Adam’s apple removed, and stares wide-eyed at every bit of Asian pop culture he can catch a glimpse of: low-quality Korean animation, Panda snacks, billboards selling cell-phones, entire stores of sparkly pink Hello Kitty merchandise. Camilla is a stalwart little trooper, but has had a slightly harder time of it, picking at her plain chicken and rice, and is clearly exhausted by the constant sensory input. It’s astounding to watch her processing language: after ten minutes of a Chinese soap opera on some noodle-shop’s television, she can do a wicked, albeit meaningless, imitation of Mandarin. In the pool today, she played with a little Dutch girl her age, Camilla speaking in English, and the other in Dutch, with neither one of them seeming to notice. 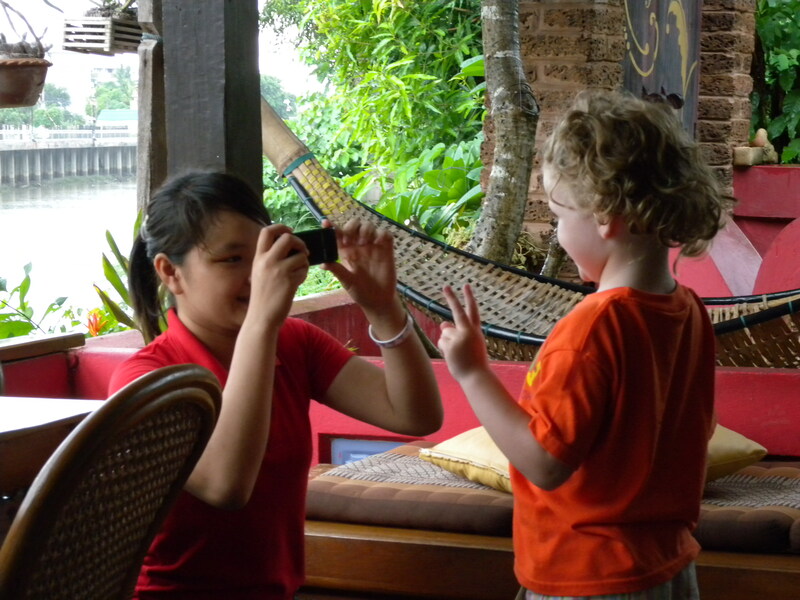 Ascher’s more shy about trying out his few phrases of Thai, just as he was when he was a baby learning to speak. She’s more enthusiastic about the fruit so far, but sticks to her pattern of not being as adventuresome of an eater as her brother. But she is more than compensated by the patting and petting she receives on an hourly basis, which also contributes to her daily excess of stimulation. 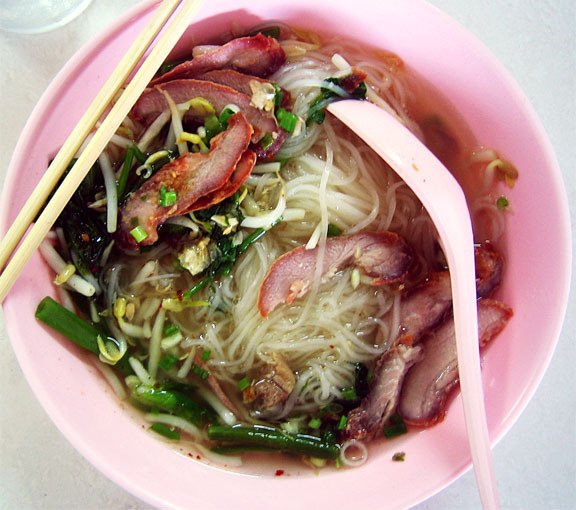 She received her Thai nick-name almost immediately: Tukita, or Tuk-ta, meaning Dolly. (Ascher got his a few days after birth, Dao, Turtle, for the way he stuck his head out of his swaddling.) She is adored by the hotel staff, by the security guards, by the high school girls gathered on the sidewalk. They all touch her cheeks, squeeze her arm, caress her hair, and utter inanities like, “I hope I have a baby just like that.” Small presents come her way regularly; frangipani blossoms are gathered for her and put into her curls. Wherever she goes, she is patted, embraced, and photographed by complete strangers. I turned in the pool the other day to see her dancing around in the wading area with two staff members squatting by the poolside, both pointing their cell-phone cameras at her. Ascher, with his brighter blonde hair, gets some interested looks, but is fairly ignored next to his sister, and seems by and large relieved about it. I told Ascher that Daddy, who is of such interest on account of his fluent Thai, and Camilla are the rock stars, and we are the groupies. The khao soi ladies took us on an adventure today, as one of them has a house to let. A date was set and a car was arranged for us to see it. Although our telling them we wanted to live in town, it turned out to be out on the road to Mae Jo in one of these many suburban developments replacing farm land. We drove past a mountain range, oxen grazing, enormous hypermarkets. The house was perfectly adequate but would require us purchasing a car, so we made polite noises about thinking about it and the subject was dropped. On the ride there and back, Camilla sat on Aunty’s lap, and admired her sparkly pink manicure, and Ascher had no choice but to sit on Pi Aeh’s lap, as he is her baby. I was squeezed in the middle, with Ascher commenting on my prickly unshaven calves on one side, and Pi Aeh on the other, pulling, none too gently, on the hair on my thighs. Thai people don’t have, she’s telling me. (Ken gets this quite a bit more, unsurprisingly, but the only Thai friend I had who might have felt familiar enough to do something like this was far too formal and polite to even dream of it). Later, Pi Aeh was pulling at the napes of the childrens’ necks, alarmed at the “stork bites” visible through their blonde hair. Farang (Western) babies have, I assure her. Mai pen lai (no problem). Chiang Mai has changed, or perhaps it’s me. Some quiet corner and streets, like our old neighborhood, have been built up beyond recognition. It’s worth remembering that the national bird of Thailand is the crane, and they continue to flock here, despite the flagging economy. There are, at least it seems to me, to be more cars and trucks than motorcycles, but I may just not remember. Fashions change, of course: I find the over-sized contacts some girls wear to make their eyes look like anime figures absolutely terrifying. More people, particularly more children, are overweight. It feels like the air is grittier, but I suspect it’s just the contrast between the particulate-free air of Worcester’s West Side and a tropical city, ringed by mountains, where two-stroke diesel engines still run wild. The food is as good as I remembered, though: khao soi and the moo daa-dio completely lived up to their memory. I’ve eaten mangosteens, lamyais, and I think tomorrow would be a good day to introduce the kids to dragonfruit and rambutans. We need to be fully ensconced in our home, however, before I return to my beloved durian. Especially in combination with beer, it’s too dangerous and intoxicating a fruit to be eaten when one is at the mercy of tuk-tuk drivers. Wish us luck—it’s a challenge to find a landlord on this side of town that will accept a six-month least—and with any luck, we’ll be in our new abode sooner than later.